This International Standard provides guidance to support the achievement of sustained success for any organization in a complex, demanding, and ever-changing environment, by a quality management approach. The sustained success of an organization is achieved by its ability to meet the needs and expectations of its customers and other interested parties, over the long term and in a balanced way. Sustained success can be achieved by the effective management of the organization, through awareness of the organization’s environment, by learning, and by the appropriate application of either improvements, or innovations, or both. This International Standard promotes self-assessment as an important tool for the review of the maturity level of the organization, covering its leadership, strategy, management system, resources and processes, to identify areas of strength and weakness and opportunities for either improvements, or innovations, or both. 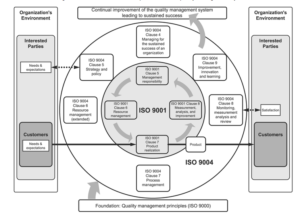 This International Standard provides a wider focus on quality management than ISO 9001; it addresses the needs and expectations of all relevant interested parties and provides guidance for the systematic and continual improvement of the organization’s overall performance. 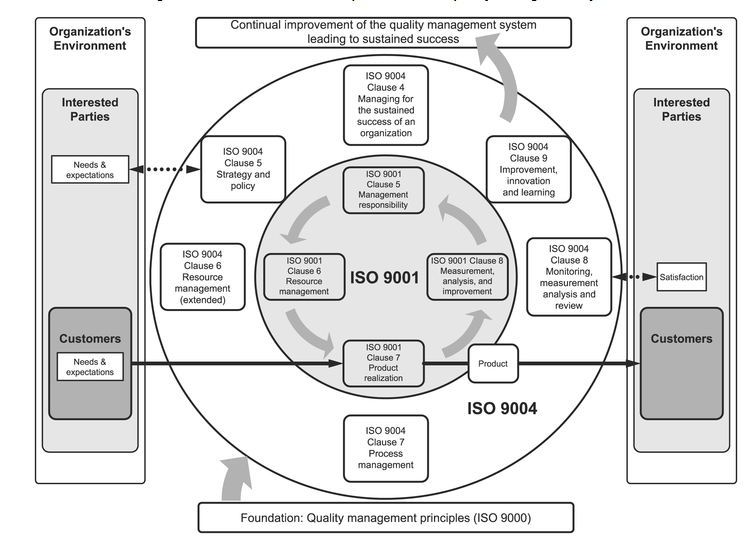 An extended model of a process-based quality management system incorporating the elements of ISO 9001 and ISO 9004 is given in Figure 1.